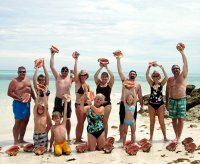 Here at Exotic Adventures, we offer Half Day and Full Day trips as our standard Grand Bahamas tours. There is NO time table to be strictly adhered to, it's your time, you can do as much or as little as YOU want! Let your imagination be your guide while you plan an escape to the beautiful waters and islands of The Bahamas. Here are just a few ideas for activities you can do to make your trip the most memorable part of your vacation, again, these are only a few ideas, it's really up to you! Snorkel Grand Bahama's colorful reefs, swim or just relax in the warm and beautiful tropical waters of the Bahamas National Park, a land/sea wildlife preserve. Or explore spectacular reefs of Elk Horn Coral and other vibrant underwater delights as well as tropical marine life. Enjoy a Private Island Excursion of off Grand Bahama and take advantage of the breathtaking beauty and lack of crowds. Go shelling and collecting sea fans for miles on secluded white sand beaches, take a nature walk and be sure to bring plenty of film to capture lasting memories of the breathtaking scenery. Or take a sunset trip with as much or as little included as you desire. Have your captain dive, spear and prepare you a fresh fish lunch. Watch as your captain dives and uses a Hawaiian Sling, the Native way to spear fish and lobster (seasonal), for your lunch. Then you can relax on a beautiful, secluded beach while you enjoy your delicious lobster or fish cooked over an open fire with savory Bahamian seasonings. Then later you can treat yourself to a local delicacy of conch salad made fresh on the boat from that day's dive. Or why not catch your own lunch. 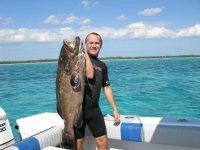 We offer Grand Bahama Light Tackle Fishing and Deep Sea Fishing. Feel the excitement and thrill of reeling in Yellow Tails, Grouper and other local fish while trolling the crystal blue waters of The Bahamas. Try Bahamian hand line fishing as well! We provide the equipment on our fishing charters and you may combine fishing with other activities. For a really different adventure why not try an overnight charter to Abaco or Bimini, sleepy family islands in The Bahamas? A sample Full Day Tour usually runs like this - the guests get on board the boat and after getting settled in, off to the Lucayan National Park to snorkel & sight see Grand Bahama wonders, then a short run up the coast (fishing of any kind is prohibited within the park area) to a new site were Captain A.J. will dive and spear fresh fish and/or lobster (when in season) for your lunch. Then back to the beach for a Bahamas beach party & cookout with unlimited rum punch. After lunch, take part in Captain A.J. 's pirate treasure hunt then spend some time tanning or shell hunting before heading back. Day and overnight trips to Bimini & the Abacos also!! !